Syrian President Bashar al-Assad has voiced hope that the visit by some members of the European Parliament to Damascus will help bring change to the policies of the West visa-a-vis his government and to end the sanctions. During a meeting on Sunday with a delegation of the European Parliament headed by Javier Couso Permuy, vice-president of the European Parliament's Committee on Foreign Affairs, Assad held the leaders of some Western countries responsible for the problems of terrorism and extremism and the refugee flows currently facing Europe for having adopted policies that are against the interests of the peoples of these states, the Syrian pro-government news agency SANA said. Assad said the MEPs «could play a significant role to correct the wrong policies of their governments that have caused terrorism to spread and led to worsening the living conditions of the Syrian people due to the economic blockade they imposed on them, forcing many Syrians to leave their country and seek refuge in other states,» according to the report. Three MEPs, who aside from the European United Left deputy Couso Permuy included Estonian MEP Yana Toom and pro-Russian Latvian MEP Tatjana Zdanoka, made a visit to Damascus last week in the course of which they met with Assad who stands accused of war crimes, as well as with parliament Speaker Hadiya Abbas and the primate of the Greek Orthodox Patriarchate of Antioch and All The East, Patriarch John X. According to SANA, the European delegation members said their visit to Syria and the suffering of the Syrian people they have seen firsthand will make them put effort to the effect of correcting the policies of the European governments and pressuring them into lifting the sanctions. The MEPs affirmed the need to keep Syria's sovereignty intact, stressing that Syrians alone should decide their country's future without any foreign interference, the report said. 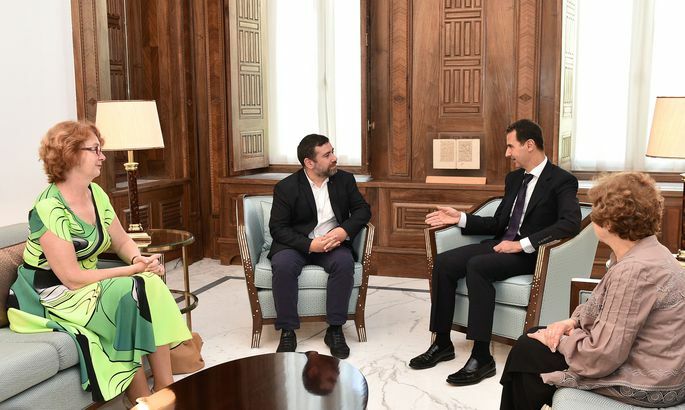 In a statement to SANA, Couso Permuy said that the meeting with Assad was an opportunity to discuss several issues and ask questions about the situation in Syria, and that at the end of the meeting it was affirmed that dialogue is the only way to resolve the crisis in Syria without any foreign interference in its affairs. Zdanoka meanwhile said that President Assad presented during the meeting «precise formulas» about what is happening in Syria, and that the meeting was very friendly and open. «Both Syrian leaders as well as people on the street tried to make one simple thing clear to us: sanctions are doing immense damage to ordinary Syrians,» Toom said in a statement released by her office after the trip. The European Union introduced sanctions against Syria after a civil war erupted in 2011 and has in the strongest terms condemned human right violations in that country. The sanctions were last extended in May until July 2017.